If you could pick the MVP of the savory breakfast world, eggs would almost always prevail. Omelets, scrambles, frittatas, burritos, sunny side up, over easy, soft boiled, on toast you name it eggs are there. Having such a dominate position on the breakfast menu, it’s a little daunting thinking about what savory breakfast dishes you can make that do NOT include these animal based staples. If you sit down and think about why we like eggs so much it’s hard to put a finger on it. By themselves they don’t really have a taste, well except for a slight tinge of Sulphur (which is weird to think of as an appealing flavor). Eggs need to be amplified with seasoning; good salt, cracked pepper, hot sauce, salsa, hollandaise, etc. So, do we love the eggs themselves…or that they are a vehicles for seasoning. If it’s not the taste, maybe it’s the texture, but even then, it’s not much. Eggs are soft and delicate, with a rich and silky mouth-feel. So many people are trying to get eggs out of their diet, whether they want to lower their cholesterol, increase their fiber intake, or are trying to not be exposed to the salmonella bacteria. But how do you replace something that is so ingrained in our society. If we could somehow replicate a soft, rich, and silky mouth-feel with a tinge of “eggy” Sulphur and the familiar earthy seasonings of a savory breakfast we would be in business. The great news is, we can! I know a lot of people have negative feelings about tofu, but in my eyes tofu is to vegans as eggs are to omnivores. Without the proper seasoning they are blank palates of boring, lackluster texture. But if prepared and seasoned correctly, can bring all the flavor and just the right amount of funk to make your savory breakfast shine. This recipe brings in two types of tofu, silken and extra firm. 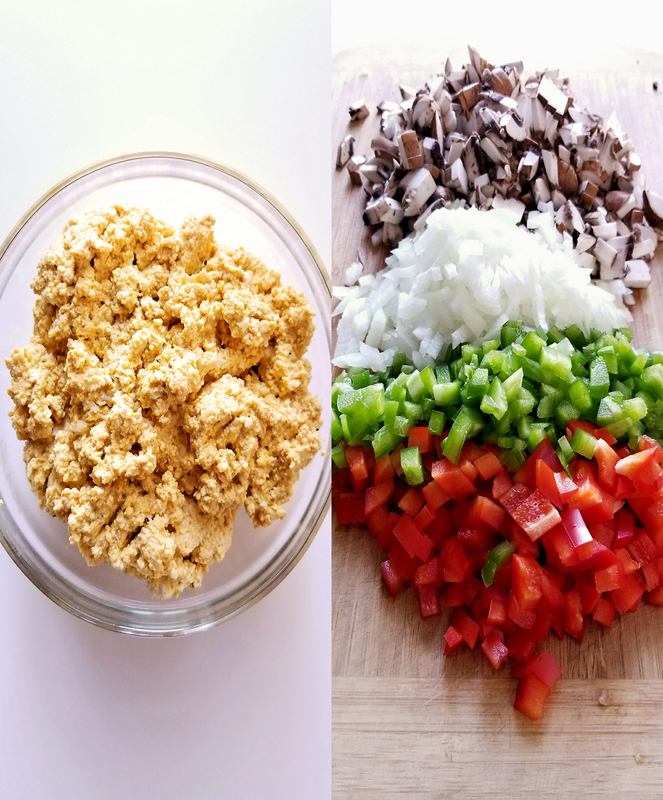 The combination of the creamy silken tofu, with its more textured and crumbly brother create a unique mouth-feel, similar to your standard egg scramble. But the star of the show in this recipe is a secret ingredient that I found at my local Indian grocer. 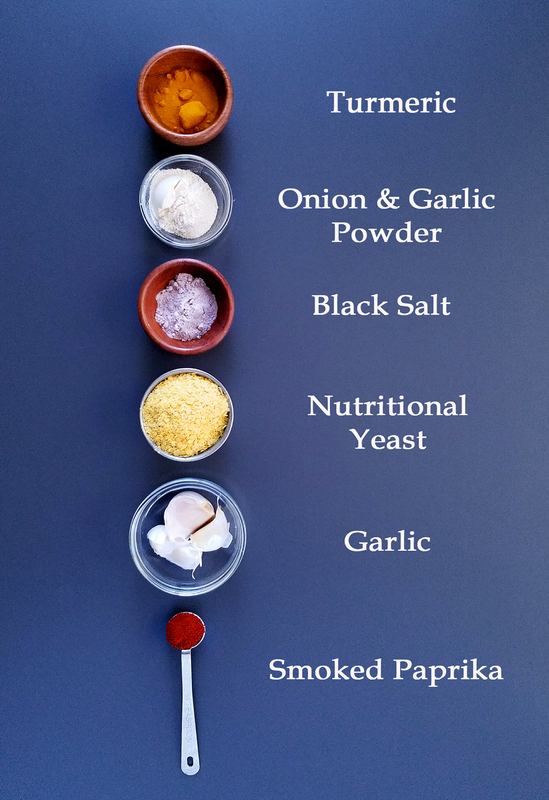 Black Salt, or Kala Namak, is a Himalayan salt that has a pungent aroma of Sulphur similar to hardboiled eggs. It’s the missing link to plant based “egg” dishes to replicate that strange but acquired taste. You can find it at most ethnic grocery stores, or you can order it online. It is a great investment and addition to your spice rack and will last you a very long time. Marinating the tofu with black salt and other earthy seasonings like smoked paprika, nutritional yeast, onion powder, turmeric, and fresh garlic gives it a great depth of flavor. 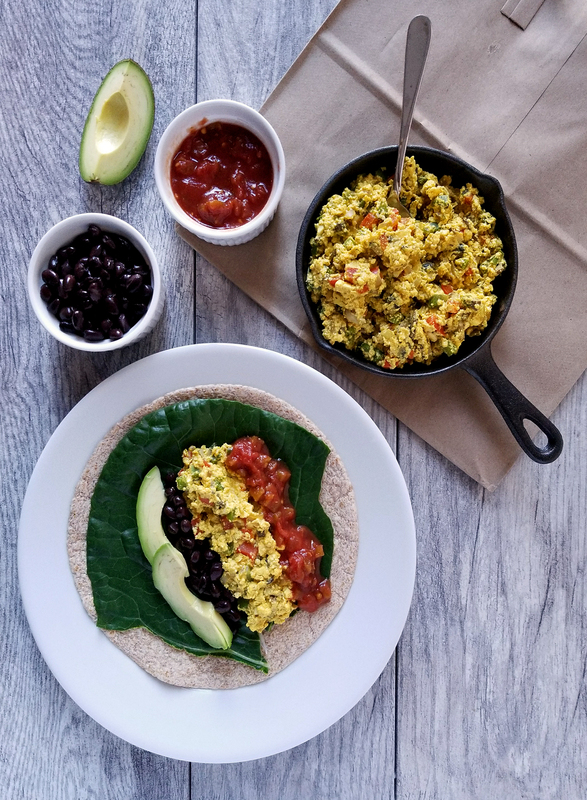 Mixed in with some fresh sautéed veggies like mushrooms, peppers, and spinach and you have yourself a scramble ready for any vehicle you choose. I decided to make hearty breakfast burritos, but you can easily have it by itself or on some freshly toasted bread. And the best part about this dish, is that it can be reheated and it’s SAFE, you don’t need to worry about cooking it all the way through to avoid a bacterial infection because you are not dealing with a raw product. I have converted many egg lovers with this recipe, now it’s your turn! 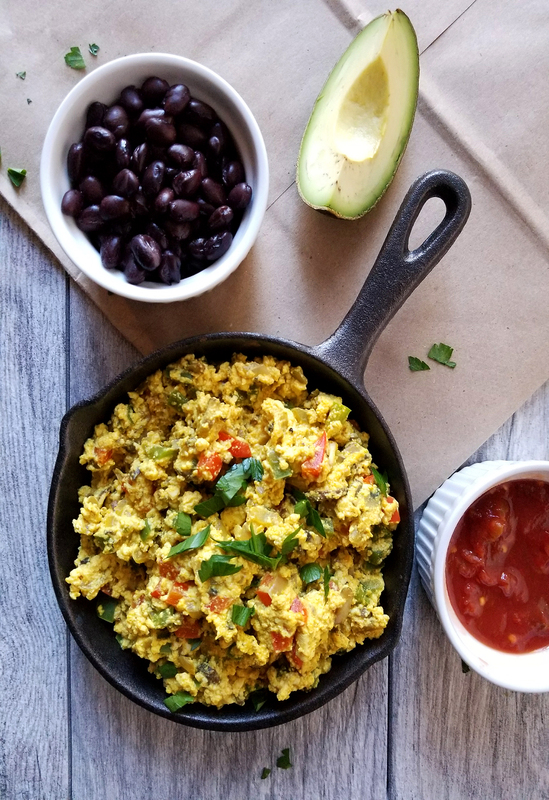 Flavor packed, protein rich and deceptively "eggy" tofu scramble that will give you a killer plant based option for a traditional savory breakfast. 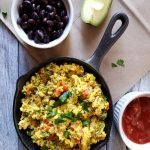 Perfect with breakfast toast, grilled tomatoes, and breakfast burritos! Remove the extra firm tofu and drain off the excess water. 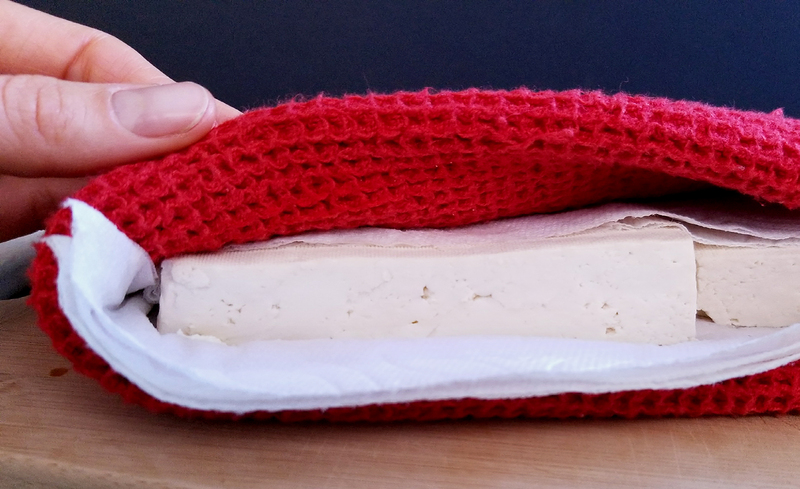 Slice lengthwise and place in between a kitchen towel lined with paper towels. Gently press down on the block to remove any excess moisture. Bring a large sauté pan to medium-high heat and add the mushrooms. Do not add any water, the heat will release the natural moisture from the mushrooms. Stir the mushrooms and add a pinch of salt. When the mushrooms have released all their water (about 3-5 minutes), remove from pan and set aside. In the same pan add in the onions and bell peppers and sauté for a few minutes, stirring frequently. When the onions are slightly translucent add in the spinach and cook until it wilts (about two minutes). Drain any excess moisture and add the veggies to the mushrooms. Add in the tofu mixture to the pan and heat for a 2-3 minutes, warming up the mixture and toasting the spices. Add in the veggies and cook a few minutes more. Finish with some freshly cracked pepper and parsley. *Extra firm tofu is refrigerated, while silken in not. Silken tofu can be found in the ethnic aisle of the grocery store near the sushi ingredients. 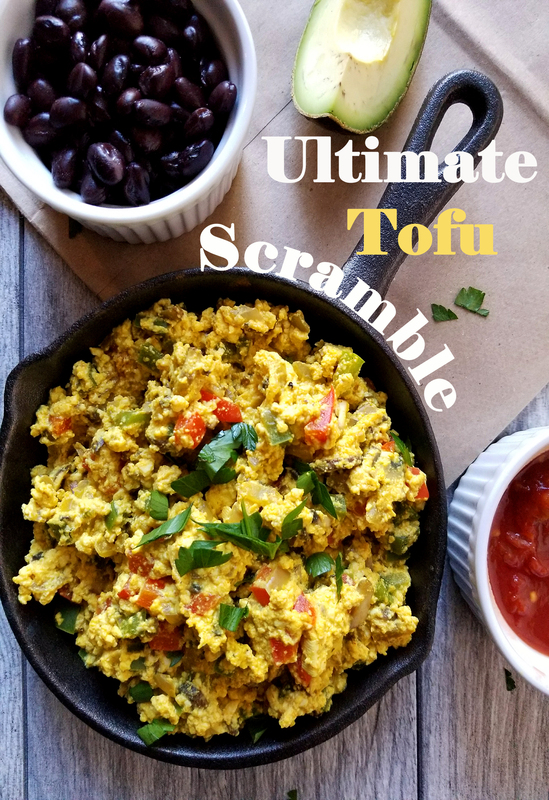 You can also use two blocks of extra firm tofu if you want a sturdier scramble. *You can make the scramble the day before. The tofu will actually have a stronger flavor the next day since it will have time to absorb all of the spices. 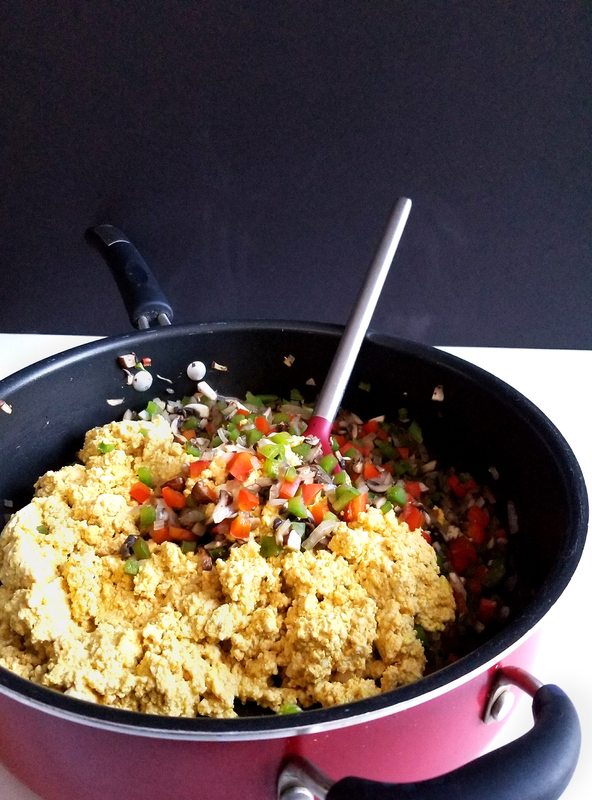 *This scramble is a great way to feed a crowd. Make it the day before and create a breakfast bar. Big bowl of fruit, sliced tomatoes, sliced avocados, hot sauce, salsas, toasted bread, warm tortilla, fresh beans, and some mimosas and you've got yourself a party!